The Mississippi river drains the center of the United States into the Gulf of Mexico and runs a total of 2320 miles from its headwaters in northern Minnesota to the Gulf . As a kid traveling with my mom and my aunt every time we would get to a bridge that crossed the Mississippi they would say “ Can you spell Mississippi with no I’s?” I dutifully played along and said “no” then, (thankfully) the one not driving would close her “eyes” and spell Mississippi. I never misspell Mississippi. Thanks mom. As a big kid, Wendy and I spent a week in Memphis and a little further downstream at the King Biscuit Blues Festival in Helena, Arkansas. We saw a great bunch of blues acts both at the festival and on Beale Street. We had wonderful BBQ everywhere and Mississippi Mud Pie at B.B. Kings, YUM. We even took a riverboat trip on the Memphis Queen and heard about the history of the river. Or not. In fact “River” was the only word we could make out over the speakers on the entire trip. “Goboldygook blah blah blah River blah blah …. 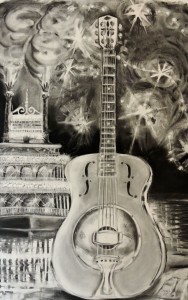 As part of our Current art show at the Octagon Gallery you can see Wendy’s charcoal drawing ( detail of drawing shown below) of our Memphis memories along with my new group of river themed furniture. I hope you will join Wendy and me for opening night of Current April 20, from 7-9 pm at the Octagon Gallery in Westfield, New York.